Cluster training means groups of singles designed to overload the total movement. 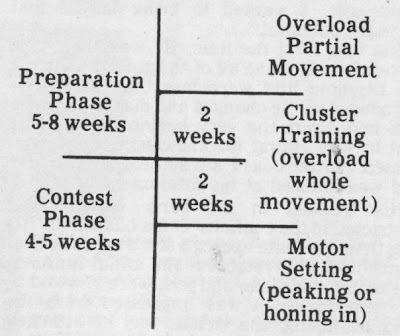 It fills the gap between overloading partial movements (which are usually done in the Preparation Phase) and motor setting (which is usually done in last two or three weeks before peaking or the Contest Phase). Before this type of training there was a gap. Something really needed to fit in between trying to gain power in a partial movement (partial movements are used to either strong or weak areas. The advantage is that great overload for the area can take place), and peaking or honing in on the whole movement. This is what many would call motor setting. Motor setting is practicing singles not in great, but sufficient numbers and rest periods to prepare the lifter for what he is to do in competition. Overloading a partial movement, an example being in the form of hangs, is very important because this overloads the position the lifter is strongest at to its fullest with free weights. Yet this area can be overloaded, though not as strongly, by doing enough singles with enough intensity and with properly designed rest periods to facilitate adequate recovery to make each single an all out power movement with little endurance quality needed. Enough has been written on muscle typing to simply state here that in weight lifting we want to mainly work the fast twitch. In Cluster Training, where we are overloading the total movement, we want to keep in mind that fast twitch muscle fibers have little endurance capacity. When contracting continually they may be able to sustain themselves 5 to 10 seconds. To be able to go again, they need a minimum of 30 seconds rest when beginning and more than 4 minutes later on. I suggest no longer than 4 minutes rest as the body is cooling off at this point. To not have adequate rest means that more slow twitch muscle fibers will be called into play. This is not what is needed when doing a single competitive lift. We are concerned with overloading fast twitch and not slow twitch muscle fibers. Based on the above and with data since 1974 from foreign coaches, I will give a chart (Chart One) which shows Cluster Training and how it works in terms of intensity, number of singles in a cluster, number of clusters and rest periods between singles in a cluster and rest periods between clusters. There are two phases given: Preparation and Contest. I suggest that the last two weeks of the Preparation Phase be used for Cluster Training and the first two weeks of the Contest Phase also. The difference between the two is more intensity, less work, more rest in the latter. This might be shown as in Chart Two. I will list three, four and five-day programs to show how Cluster Training can fit into Olympic lift training. Feel free to adapt this to your own specific discipline. You will notice that the workouts can take 1½ to 2 hours. You might be worried about working such a long time doing these clusters of singles, but remember, the percentages are within capabilities and there is enough rest. The feeling when completing these is a refreshing overall tiredness, not the deadness that sometimes accompanies doing partial overload movements of reps or singles of much higher intensity. One only has to look at sprinters in track and field to see similarity. They term their work “quality sprinting” where they do maximum or near maximum sprints for 6-8 seconds, and many clusters of them. In this phase of their training they don’t want to train the endurance factor. Going back in weightlifting 20 to 25 years, routines were published where lifters did maximum or near maximum presses from racks every minute for an hour. This was a simple form of Cluster Training. Excellent results were reported. This is not the last word in Cluster Training. Refinements will be made as more data becomes available. At this stage we have a working framework of a concept very badly needed. The WHOLE athletic movement needs to be OVERLOADED after overloading partial movements and before final peaking. Only through overloading does increase in power take place.